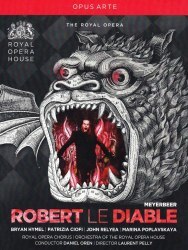 Robert le Diable was one of most influential works of art of the whole 19th century, and not just in the world of music. With it Meyerbeer all but invented the genre of Grand Opera with its large scale, its big cast of principal characters and, most importantly, its integration of scenic spectacle with pictorial music. Its Act 3 ballet scene, for the resurrected ghosts of some debauched nuns, was captured on canvas by Degas, and afterwards it would be unthinkable to write for the Paris Opéra without including a ballet in the action, as Verdi and Wagner later found to their frustration. It was probably the most performed opera of the entire 19th century, but by the 20th it had fallen out of favour, not least because its innovations came to seem clichéd and because other forms of music-drama had superseded it, be it Wagner’s brave new chromatic world or the blood-and-thunder style of verismo. It notched up barely any performances in the 20th century, even falling out of favour in France, so it was exciting when the Royal Opera decided to mount a new production in 2012, the first in the company’s modern history. To say, however, that the production’s gestation period had been troubled would be to put it very mildly. It was so beset by problems that by the time of the opening night it seemed as though Bertram’s curse was hanging over the opera itself. The title role was first mooted for Juan Diego Flórez but he pulled out when it was still at the conception stage - and, to be fair to Flórez, he stresses that he never agreed to it. Marina Poplavskaya withdrew from the role of Alice and then reinstated herself shortly afterwards, no doubt to the great relief of the Covent Garden management. Diana Damrau had to withdraw from the role of Isabelle due to her pregnancy and her replacement, Jennifer Rowley was dropped from the role in the very week of the first performance. Thanks to some sort of scheduling miracle Patrizia Ciofi, one of the few current sopranos who has sung the role, was brought in for four performances and Sofia Fomina for the last two. It was Fomina that I saw on the last night of the show, and I was a little disappointed that she wasn’t the one they filmed because she was spectacularly good, making me wonder why the Royal Opera hadn’t just engaged her for the entire run. The show was then met with lukewarm reviews and I’m sure the ROH came to wish that they’d never bothered reviving it. Now the DVD is here, though, you can make up your mind for yourself. It’s true that Meyerbeer’s work is problematic for those of us who are used to later 19th century opera. The plot is clunky and unnecessarily convoluted, and most of the characters are archetypes that make no effort to be believable. Unfortunately that’s something that is not helped by Laurent Pelly’s rather knowingly self-aware production. Unusually for this director, who is normally so good at casting new light on the works he stages, he seems unsure of how to approach this work, as if he is intimidated by its heritage, and so he seems to go out of his way to avoid taking it seriously. His sets are, by turns rudimentary - the skeletal set for the inn of Act 1 - or ironic, such as in the toytown castle for Isabelle’s scenes or the outline of the church in the final act. The one thing that is lacking from his staging is the one thing that was so central to the success of French Grand Opera, namely a sense of the spectacular. The only place where he even makes an attempt at this - and does so rather successfully - is the opening scene of Act 3 where Bertram communes with Lucifer inside the mountain. Thanks to some clever computer projections, we are treated to the sight of hell-fire together with numerous demons working mischief with their pitchforks. Elsewhere, though, there is little to divert the eye, and Pelly doesn’t seem that confident in directing his singers, either. Bryan Hymel as Robert, in particular, is far too reliant on the look of pained indecision, particularly in the excruciating final scene. He is given little else to do but walk around and grimace. Unlike in the theatre, he doesn’t benefit from the close-up of a DVD. One reviewer commented at the time that Pelly’s production puts the whole work in inverted commas, and I think that’s a good way of understanding it. It’s not always ineffective - I actually quite liked Isabelle’s castle - and sometimes it works rather well, such as that scene on the mountain. More often, however, it’s downright annoying, such as the cartoonish knights in the first scene or the mock medieval costumes for Isabelle’s ladies. The key scene with the ballet looks dreadful, with a drab set and choreography that was jerky, unattractive and so overly-sexualised that it looks more absurd than suggestive. The final scene seems to lapse into self-parody when Robert - who, by this time, has surely lost all the audience’s sympathy - is struggling to decide between the hellish Bertram and the saintly Alice. Cue John Relyea standing next to a demon’s mouth - which later swallows him - on Robert’s left while Marina Poplavskaya wilts within some cardboard clouds on his right. It has all the dramatic subtlety of a Warner Brothers cartoon. Meyerbeer’s music was inventive in his day, but our 21st century ears have grown so used to hearing its types that more often it sounds hackneyed and, at times, interminably repetitious. However, I suspect that he would be pleased with the very good performances it is given here. The title role often requires the tenor to launch himself into the stratosphere, and Bryan Hymel does this very effectively indeed. In fact, his voice has a burnished, heroic quality above the stave that sounds very good, even if there is a tiny hint of strain at times. He certainly has the heft to make himself heard against Meyerbeer’s luxuriant orchestration. Patrizia Ciofi does a brilliant job as Isabelle, especially considering the emergency circumstances in which she was drafted in to take the part. She has a rich, confident voice which gleams above the stave, even though it has an edge of brittleness. Her Act 4 cavatina, the finest thing in the opera, sounds magnificent as she crests above the wave of orchestral sound, and she also looks comfortable within Pelly’s staging. Marina Poplavskaya’s Alice is satisfactory but unexciting. She sings the part with an oddly vacuous tone and I often wished for someone with more clarity and richness. It doesn’t help that her acting is as much a cardboard cut-out as Pelly’s sets. Jean-Francois Borras brings attractive tone and bags of character to the small role of Raimbaut, but the chief hero is John Relyea’s Bertram. Relyea has stepped into the Satanic shoes of great basses like Samuel Ramey, who so excelled at playing devils and villains. The cavernous depths of his voice sound bottomless, and he is equally impressive when plumbing the depths or scaling the heights. He also plays the role with a touch of irony that works well. I remember hearing him many times at the Edinburgh Festival when he was first starting off, and it’s exciting to now see him singing the big parts he deserves. The orchestra play well under Daniel Oren and they bring alive the colours in Meyerbeer’s score that are undeniably attractive, though not even they can lighten the longueurs which seem to get ever longer as the opera progresses. If you want Robert le Diable then this is the version to get: you have very few alternatives. The opera is undeniably problematic, as much for its unwieldy music as for its plot which is eclectic to the point of disunity, and that’s before you even consider the staging. It works fine as an “extra” in your operatic library, but I worry that the problems that Covent Garden faced in bringing it to the stage may have done even more damage to Meyerbeer’s staging prospects than already existed. Some of his other operas are well worth a look, most notable Le Prophète, which is fantastic. I worry, however, that my prospects of ever seeing that staged may have receded even further thanks to the problems caused by Robert.